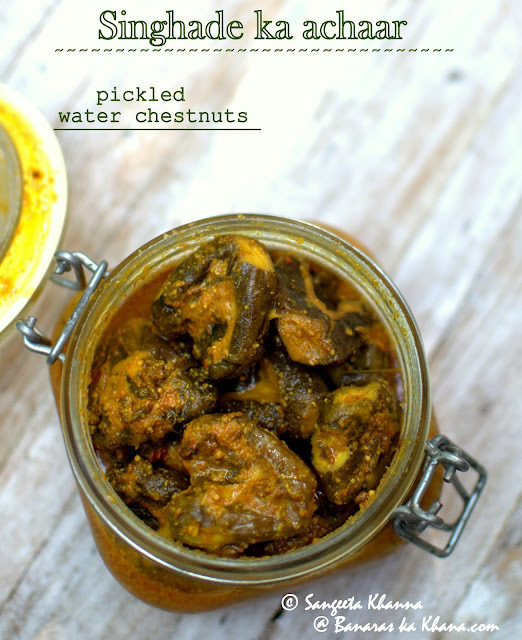 Singhade ka achar (pickled water chestnuts) is one of those seasonal pickles that very few people make. 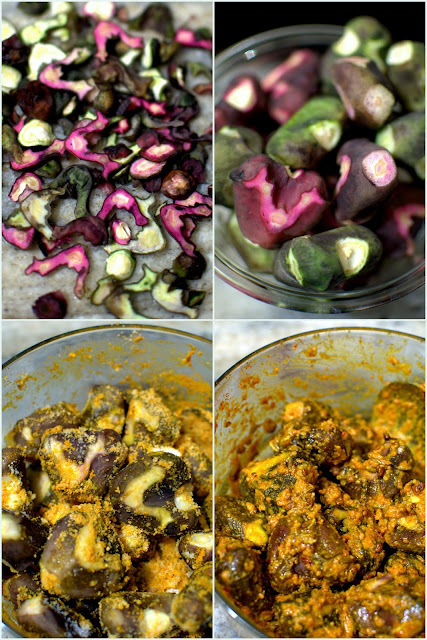 In fact pickling was mostly associated with aam ka achar, bhari mirch ka achar or nimbu ka achar more and these pickles were a must have in any Indian kitchen (read north Indian kitchen). But few families (read chatori families) kept pickling seasonal vegetables on the sly and serving such seasonal pickles as a fresh condiment to bring variety and taste to the everyday meals. All of those gobi matar ka achar, gobhi, shalgam, gajar ka achar, sem ka achar and even alu ka achar made with new potatoes come into this category of seasonal pickles. Many of these pickles are called pani ka achar as no oil is used in making these or very little oil just to bring the spices to life. It will be useful to mention that pani ka achar is more of a mustard based pickle that gets fermented a little in a day or two and tastes very good, apart from being a good probiotic supplement. 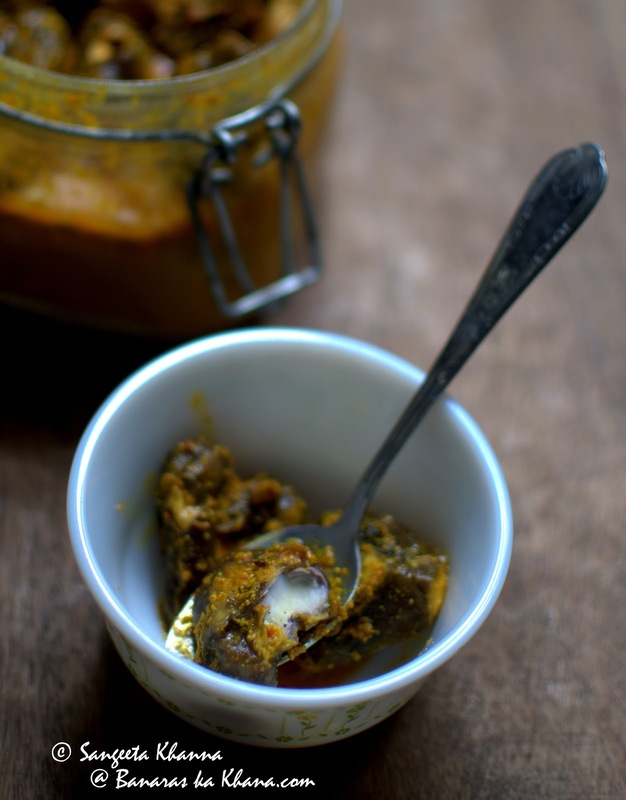 I will share a few recipe of pani ka achar, this mooli ka achar comes into that category. This singhade ka achar has the pickling spices used for aam ka achar, the most common and popular pickling spice mix in north India. I made sooran ka achar recently with the same spices and it has been the must have condiment on the table right now. You can pickle any vegetable and even some fruits using these spices, the treatment of the vegetable will differ according to the water content they have. And singhadas have loads of water in them. The tough skin contains the nut (kernel) inside which is in fact a very soft and watery nut. They start coming to markets in early winter, the season lasts about 6-7 weeks. The water chestnut kernel gets harder and more starchy by November, the hard kernel is preferred more for boiled water chestnuts and curries. Some people like this achar made with softer (tender) water chestnuts while some like it with the hard ones. I prefer the soft singhada for achar. 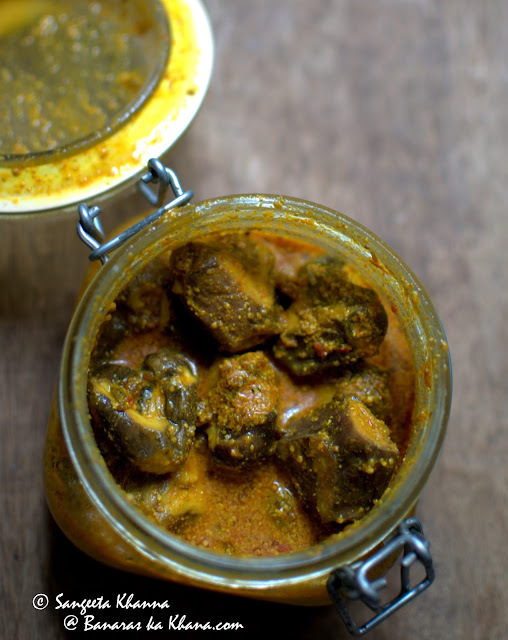 Singhade ka achar is a fresh pickle that is meant to be consumed in maximum 2 weeks. It can be preserved for longer duration but the fresh taste will be lost after a month or so and the specialty of this pickle will be lost. 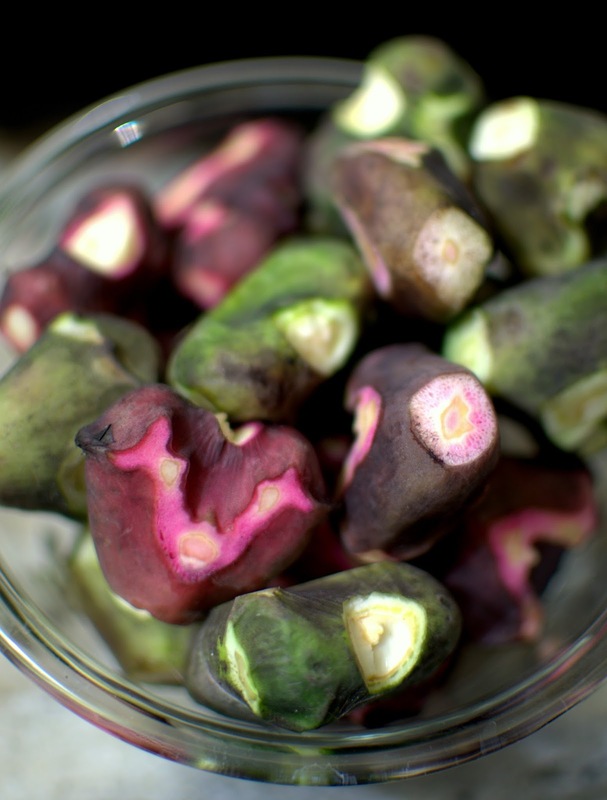 Each water chestnut is peeled in a specific way so as to keep the soft parts of the skin on and to remove the hard horns, also to remove the tip from both ends to allow the pickling spices to seep in. 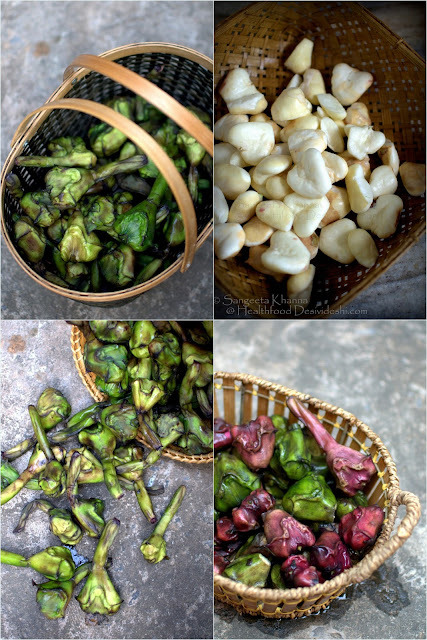 The picture below would give you an idea about how to peel the water chestnuts to make the achar. Rinse and clean the water chestnuts nicely. Drain. No need to sun dry. Peel the water chestnuts, they look like this after partial peeling. Alternately, you can just remove the thorns and cut the water chestnuts in 2 halves lengthwise. Boil enough water in a deep pan to submerge all the water chestnuts. Add a little salt (1 tsp per liter) and tip in the water chestnuts in boiling water at once. Wait for 2 minutes and drain the hot water, retain the water chestnuts in a colander. Add the salt and turmeric powder to the water chestnuts and toss to mix. Now add the mustard powder too, toss and keep aside. Start preparing for the other spices. Heat mustard oil in a pan, add the asafoetida, fenugreek seeds and nigela seeds one by one, waiting a few seconds before one spices starts sizzling. Then add the fennel and omum (ajwain) together and remove the pan from stove. Mix well, add the red chilli powder and pour the spice mix over the water chestnuts seeped into salt, turmeric and mustard powder. Mix well to coat them all and fill in a sterile glass jar. The pickle will be ready to eat in 2-3 hours. Refrigerate after about 4 hours. This pickle keeps well refrigerated for 2-3 weeks. At room temperature it lasts for a couple of days, adding more salt and mustard oil can make it stable at room temperature. The water chestnuts release a lot of water by the next day, shake well before serving. You can add boiled and cooled baby potatoes to this pickle to make a nice variation after 3-4 days when there is enough watery liquid in it to soak up the potatoes. The kernel of the water chestnuts remain whitish but take up the flavours of the spices very well. You would love singhade ka achar I am sure and will keep making it once you get the taste. It is as easy as making a subzi and can be served as a side dish during singhada season. Tastes great with parathas and daal chawal, tahiris and khichdi etc. There a loads of singhada recipes on this blog. Check out the singhade ke atte ki roti if you haven't seen already. Singhade ke atte ki roti is a fasting bead recipe you might like to try this Navratri. 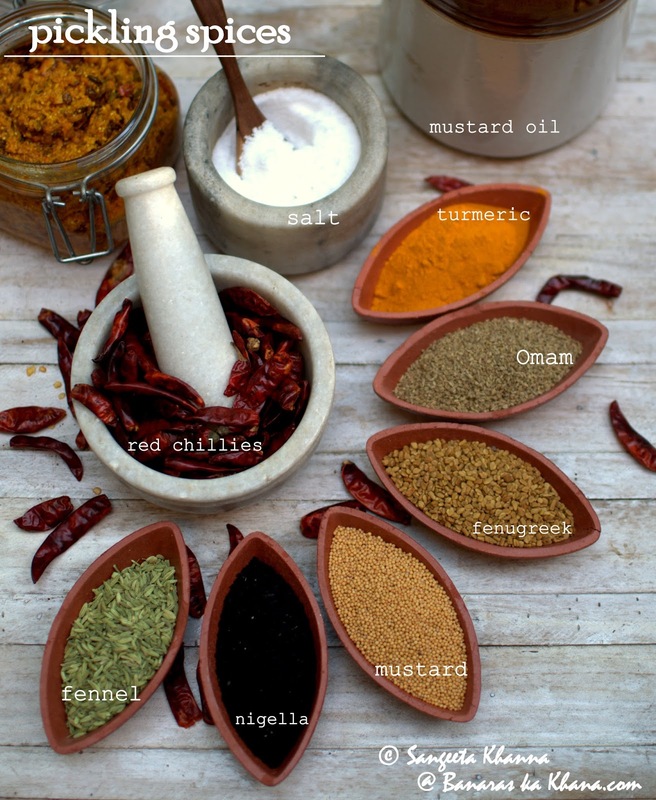 Which brand of mustard oil do you use? Anything in particular? Most of the ones in our local shop don't have much of that mustard ka smell, and I'm suspicious that they are adulterated. Can you advise? I rely more on the local brands here K. TJ's (Tihar Jail's enterprise) mustard oil is good, so is Patanjali's. If I don't get any of these two I buy from Down to Earth organic brand. Hope it helps. Really? Ok, I will have to look into that. Thanks! Mem do you start ur channel on youtube?